A few years ago, I made the switch to eating only real, whole foods, and buying organic, grass-fed and free-range as much as I could possibly afford. After reading dozens of books and watching a handful of documentaries about the dangers of pesticides, antibiotics, hormones and other toxic chemicals found in our food, I truly felt like I had no other choice if I cared at all about my health (and the welfare of animals, for that matter). I had to make what I put in my body a priority. Meanwhile, I was shampooing my hair with Pantene, slathering St. Ives lotion all over my skin, spritzing D&G Light Blue on all my pulse points and was generally unconcerned about what I was putting on my body. Or rather, I assumed that because most of my makeup was high-end and from Sephora, and most of my skincare was simple, dermatologist-recommended products that I was safe. Oh, how wrong I was. It all started when I heard about Skin Deep, the Environmental Working Group’s guide to safe, non-toxic beauty products. The more I learned about the cosmetic industry in the U.S., the more disgusted and terrified I became. 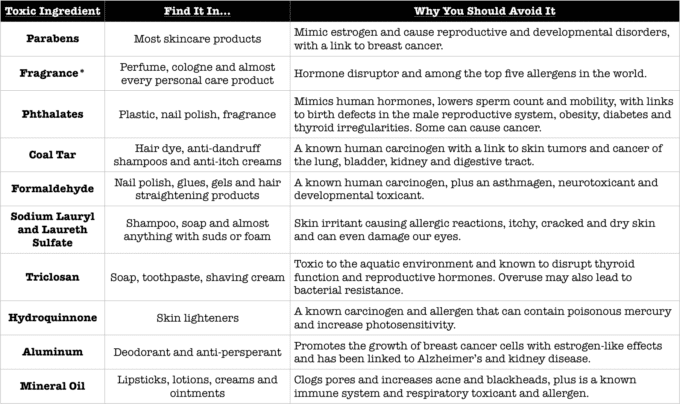 I couldn’t believe the known carcinogens, hormone disruptors and skin irritants mainstream companies were intentionally putting into the same products I was coating myself with every day. 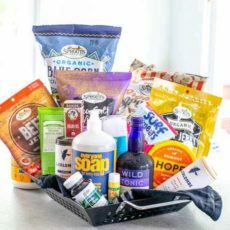 I was shocked at how little those products are regulated in America, how misleading product labels and claims could be and how few people seemed to care or even know that this was going on…myself included. Here I thought I was this conscious consumer, but in reality, I had been unknowingly putting toxic chemicals on my skin, in my hair and all over my body for decades. Even worse: everything you put on your skin is immediately absorbed into your bloodstream. 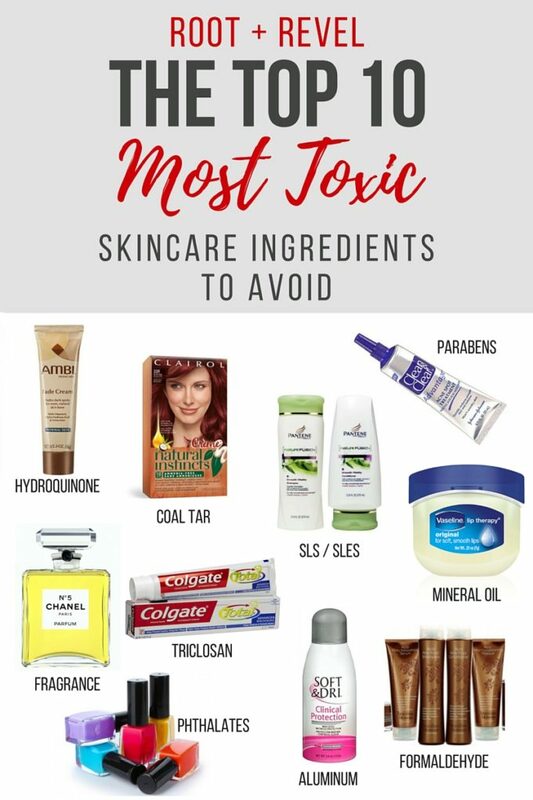 And according to the EWG, the average woman uses 12 products containing 168 different ingredients daily, many of which are known to cause cancer, make us infertile, mess with our hormones and/or irritate our skin and our lungs. *Fragrance Note: Recent research from EWG and the Campaign for Safe Cosmetics found an average of 14 chemicals in 17 name brand fragrance products, many of which are toxic. Unfortunately, federal law doesn’t require companies to disclose what’s in their fragrance mixture, as it’s considered a trade secret, so none of these chemicals are listed on the ingredients label. Even “unscented” products often contain fragrance, so your safest option is to avoid any products with Fragrance in the ingredients list. 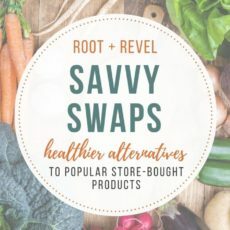 I hope that you’ll see just how important it is to toss those toxic products and swap them for safe, natural alternatives. Don’t feel like you have to do it all at once. Next time you run out of an item, try replacing it with a safe substitution and slowly you can rebuild your toiletry cabinet. Start reading the labels on all of the products you use and check them against EWG’s Skin Deep Database, which awards a score to nearly 65,000 products based on their toxicity and potential for harm. Keep an eye out for upcoming posts on the best substitutions for common products and some great DIY beauty recipes that are even more effective than their store-bought alternatives. I struggle with finding eye makeup remover that is safe. I have tried coconut oil and some other oils, but they are not getting the liner and mascara off. Any suggestions? I use Wen shampoo no sls. Have anything else bad? So what are some great products you recommend to switch to? brands? Hi again, Andrea. 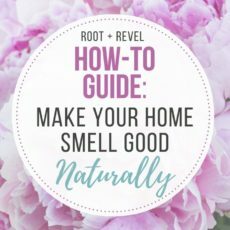 Just wanted to let you know about some brands I recommend… that post is now live: https://rootandrevel.com/5-affordable-natural-beauty-brands/. Be sure to let me know if you try any and how you like them. Thanks for reading!